Have you ever asked yourself: “Who am I?” No one can completely understand themselves without understanding their roots or genealogy. Our life can be compared to a tree with roots and branches. Our roots extend back to the origin of man. Our DNA carries genetic information from the time of Adam. We are the product of our roots. We must also provide the branches that will be the next generations. Our responsibility extends in both directions to an understanding of our roots and preparing our branches. We are kind of like a chain. The strength of each link is only as strong as each link before; and the following links are only as strong as the link through us. Genealogy provides us–when coupled with prophecy—a way to know where man originated. It also provides us with the place of our inheritance after mortal death in the resurrection. The Bible provides us with a genealogy of man from Adam to Jesus. How could this be accurate? Adam lived to the life of Lamech the father of Noah. Noah lived to the time of Abraham. Noah and his son Shem lived with Abraham for thirty-nine years. How easy it was for an accurate genealogy to be kept! After the earth was prepared for habitation by man, the physical body of Adam was created. “7 And the LORD God formed [the physical body of] man of the dust of the ground, and breathed into his nostrils the breath of life [his spirit that was organized in the beginning of this creation]; and man became a living soul.” (Gen. 2) The spiritual body of man is eternal. We inhabit this tabernacle of clay until death when the spirit returns to Jesus and spends the time from death to the resurrection in one of two places: the bosom of Abraham or with the spirits in prison (erroneously called hell from pagan mythology). Jesus spent the three days His physical body lay in the grave preaching the gospel to these spirits in prison. One of the greatest principles of life and genealogy is that every time God has had a people on the earth–that He recognized as His own through His prophets–He provided an inheritance on the earth for that people in the resurrection. Here lies the answer to where man originated. The real heaven will be here on earth. Those who know God and obey the gospel—either in mortal life or in the spiritual world–will inherit and live on these lands after the resurrection. The earth will be restored to its original paradisiacal glory. The people of God will inherit one of two lands depending on their genealogy. These inheritances will continue forever unless broken by man. The seed of man is carried only in the male line. Therefore, all genealogy among God’s people was kept only through the male line. The first chapter of Matthew gives us the correct genealogy of Jesus from Abraham to Judah, to David, and to Joseph—his father. The Apostle Luke also testified of the same genealogy. “And Joseph also went up from Galilee, out of the city of Nazareth, into Judaea, unto the city of David, which is called Bethlehem; (because he was of the house and lineage of David.” (Luke 2:4) Luke traces Jesus’ lineage from Adam to Abraham and hence to Judah, David, and Joseph (Luke 3:23-38). Genealogy also determines what land each people of God will inherit in the resurrection. One of the most important reasons to understand genealogy is because God has given only two lands on the earth to His people according to their genealogy. Will this not be a special blessing? Would not one who lived in America, knew God, and obeyed the gospel, not want to receive an inheritance in America; and then be able to travel to all distant lands as easy as going next door to your neighbor? This very special Promised Land was also given to the seed of Joseph—the son of Jacob—for him and his progeny. When Israel (Jacob) blessed Joseph, his words are clear. “22 Joseph is a fruitful bough, even a fruitful bough by a well; whose branches run over the wall: 23 The archers have sorely grieved him, and shot at him, and hated him: 24 But his bow abode in strength, and the arms of his hands were made strong by the hands of the mighty God of Jacob; (from thence is the shepherd, the stone of Israel:) 25 Even by the God of thy father, who shall help thee; and by the Almighty, who shall bless thee with blessings of heaven above, blessings of the deep that lieth under, blessings of the breasts, and of the womb: 26 The blessings of thy father have prevailed above the blessings of my progenitors unto the utmost bound of the everlasting hills : they shall be on the head of Joseph, and on the crown of the head of him that was separate from his brethren.” (Gen. 49) Native Americans are of the seed of Joseph and will soon turn to God and inherit their land. This is the same land given to the saints of God from Adam to Noah. Such blessings by one holding authority from God are always perfectly fulfilled. Gentile saints of God are to receive an inheritance in this same land. It will be identified in this article. Abraham was born tenth from Noah. Noah’s lifespan reached Abraham. Noah, his son Shem, and Abraham spent thirty-nine years together. Is it any wonder how a perfect knowledge of God and genealogy was kept from Adam to Abraham? Genealogy is the key to what land the people of God will inherit in the resurrection. After the death of Noah and Shem, Abraham was recognized by God as the most righteous man of his time. In recognition of this, he was given the land of Canaan by God for an inheritance for him and his seed. This promised was renewed with Isaac and then with Jacob. The seal of this covenant was circumcision of the flesh. Abraham and his seed through Isaac and Jacob never inherited the land of Canaan in mortal life. This will be realized in the resurrection. There are only two lands blessed by God for the people of God to inherit in the last days: Zion [with New Jerusalem] and Canaan [with holy Jerusalem]. Zion was the abode of the saints of God until Noah. The City of Enoch was located where the New Jerusalem will be built in Zion. The land of Canaan was given by God to the seed of Abraham, Isaac, and Jacob. “And I will give unto thee, and to thy seed after thee, the land wherein thou art a stranger, all the land of Canaan, for an everlasting possession; and I will be their God.” (Gen. 17:8) The seed of Joseph—son of Jacob, including Native Americans–was given the land of Zion as their inheritance. Gentile saints—daughter of Zion—were given an inheritance in the land of Zion. God does not go back on His promises. “6 In that day, saith the LORD, will I assemble her that halteth, and I will gather her that is driven out, and her that I have afflicted; 7 And I will make her that halted a remnant [daughter of Zion], and her that was cast far off a strong nation [seed of Joseph]: and the LORD shall reign over them in mount Zion from henceforth, even for ever. 8 And thou, O tower of the flock [latter day prophet James J. Strang], the strong hold of the daughter of Zion, unto thee shall it come, even the first dominion [July 8, 1850]; the kingdom shall come to the daughter of Jerusalem. 9 Now why dost thou cry out aloud? is there no king in thee? [James was murdered with the help of a US Steamer] is thy counsellor perished? [Apostles and High Priests are gone; but, the office of Elder remains] for pangs have taken thee as a woman in travail. 10 Be in pain, and labour to bring forth, O daughter of Zion, like a woman in travail: for now shalt thou go forth out of the city, and thou shalt dwell in the field, and thou shalt go even to [mystery] Babylon; THERE SHALT THOU BE DELIVERED; there the LORD shall redeem thee from the hand of thine enemies.” (Mic. 4) Prophecy tells us that Zion will be built up again as bride prepared for her husband. Understanding these lands and what prophecy provides us, provides the answer WHERE MAN ORIGINATED. All are familiar with the land of Canaan. Few have an accurate understanding of Zion, the City of Zion, and the Land of Zion. There was also a city of Zion outside of the city of Jerusalem. “Nevertheless David took the strong hold of Zion: the same is the city of David.” (2 Sam. 5:7) It is not written whether this city will return as such. There is to be a Holy Jerusalem. The LAND OF ZION is North and South America. More specifically, it refers to North America. “Great is the LORD, and greatly to be praised in the city of our God, in the mountain [kingdom] of his holiness. 2 Beautiful for situation, the joy of the whole earth, is mount Zion, on the SIDES OF THE NORTH [North America], the city of the great King [Jesus].” (Ps. 48) This NEW CITY OF ZION will be in the center of America at Independence, Missouri. This will be the NEW JERUSALEM. “Now any person who is acquainted with the Hebrew lan­guage, knows that an improvement in the translation of the above can he made with propriety:-‑It should read thus: “Ho! to the land shadowing with[(or in the symbol of,] wings, that lies beyond the rivers of Cush. This by no means changes the sense; but reduces it to the modern style of phraseology, which I trust will greatly assist the reader in understanding the true meaning of the prophet. “But now the question is, what land does the prophet ad­dress these words to? In order to correctly come at this, we must first consider that the prophet resided at Jerusalem, or somewhere near that city; secondly, to find the land that he speaks of, it is necessary to be certain as to the location of the land of Cush or Ethiopia. “The general name that the Jews gave to all the north‑part of Africa was, “the land of Cusheamm.” Ethiopia proper, is situated south, and south‑west of, Egypt, and is now called Abbysinia; but according to Herodotus, the Ethiopian nations were very numerous; and it is evident that the Greeks, and Romans, called the most of. the African nations Ethiopians. The writer of the celebrated voyage of Hanno, (which is to be found in Mr. H. Murray’s Encyclopedia of Geography,) a Carthagenian navigator who attempted to sail round Africa, gives an account of Ethiopians near the Straits of Gibraltar, or Pillars of Hercules; also that he sailed twelve days along the western coast of Africa, which he says, was then inhabited by Ethiopians, who were very numerous. This coast in now called the coast of Morocco; hence, the ancient Moors were called Ethiopians or Cushites. Indeed, after a careful research into the history of this people, I have come to the following conclusion.‑-Cush was the son of Ham, and his progeny, soon after the flood, settled somewhere in the neighborhood of the river Euphrates; but at a very early period, some of them emi­grated to Africa, and at first, located somewhere about the head waters of the Nile. According to Josephus, these Ethiopi­ans were a powerful nation in the days of Moses; and also, that they inhabited the country that lies south, and south‑west of Egypt; but they were a warlike people and had a great de­sire for conquest; hence, they soon spread over the north part of Africa: and in consequence of their inhabiting the greatest part of this continent, which was then known to the civilized nations, the Jews called it the land of Cush or Cusheam; but the Greeks, and Romans gave it the general name of Ethiopia, and the people they called Ethiopians, the same as we give the inhabitants of all Europe, the general name of Europeans; al­though, they are divided into many nations; therefore, it is evident that in the days of Isaiah, the north part of Africa was called Cush, and the rivers that the prophet alludes to, are those that flow into the Mediterranean sea along the coast of the Barbary states; and also those that flow into the Atlantic Ocean along the coast of Morocco. Now I presume that from the foregoing, the reader will readily discover that the prophet alludes to a land that lies directly west of Jerusalem, which course strikes the Atlantic somewhere on the coast of Morocco; but still beyond this, is the land in the symbol of wings, which must certainly be America; for this reason, no other land will answer the description of the prophet. Indeed, if the prophet does not speak of this land, then he has wrote a mess of incomprehensible nonsense. “But there is also another view, that may be taken of this subject, which perhaps will reflect new light upon it. The word Nahar not only means river, but has another signification, which is, light or knowledge. In Isaiah’s day, the Carthagenians were the greatest navigators of the world, and it is asserted, that they considered as exclusively theirs, all the Mediterra­nean sea, west of a line stretched across from Carthago to Sicily, and that they captured all the vessels, and put to death the crews, of all other nations that were found navigating within these forbidden precincts. They were also the first that navi­gated about the Pillars of Hercules, the south western coast of Europe, and the western coast of Africa. In a word, in these ancient times they had the most extensive knowledge of the sea, coasts, and islands, in these parts, of any other nation; therefore, as the word Nahar signifies light or intelligence as well as river, perhaps, the prophet alludes to a land that is beyond the extreme knowledge of the Ethiopian or Cushite navigators. However, either of the above explanations, makes the idea perfectly plain, that the prophet points to America. Joseph was of the seed of Ephraim; so, he was not qualified to translate this second book. Joseph received a vision in which he learned of his impending death. He had received four revelations that declare in the event of his impending death that he would appoint his successor; and did so according with a vision. Being called of God, it was then necessary for James J. Strang to be ordained under the hands of angels the same as Joseph. 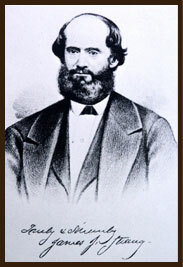 The same hour of Joseph’s death on June 27, 1844, James J. Strang—although 400 miles away–whom God had appointed through Joseph—was ordained under the hands of angels. James was of the tribe of Judah and therefore qualified to translate this Book of the Law of the Lord; which he did in 1850. I had a new edition printed in 2000. Both Joseph and James taught the same as all other prophets of God concerning saints of God being a gathered people. Saints of God from Adam to Noah were given the land of Zion. The seed of Abraham, Isaac, and Jacob were given the land of Canaan. Joseph—son of Jacob—was also given the land of Zion as an inheritance; as were gentile saints. There have also been other people of God that have lived in the land of Zion after the flood. Their inheritance will also be here. Anytime God has a people–who He recognizes as His own–they are given an inheritance or land on which to gather; and then to inherit in the resurrection. 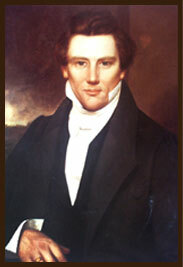 The first gathering place under Joseph Smith was Kirtland, Ohio. This was changed to Independence, Missouri; which was given by God as the center stake of Zion. The saint’s lifestyle was so opposed to that of the ruffians that lived on the edge of the frontier in Missouri, that the Governor of Missouri issued an extermination order against them; although they were guilty of no crimes. The next gathering place was at Nauvoo, Illinois. A mob from Missouri—with the help of the Governor of Illinois—were finally successful in murdering Joseph. The Letter of Appointment which Joseph sent to James J. Strang shortly before his death noted that Voree—a place near Burlington, Wisconsin—would be the next gathering place. When the saints failed to live by all the laws of God, Beaver Island and the islands of northern Lake Michigan were given as the gathering place. When the saints failed again to live by all the laws of God, James was murdered with the help of the U. S. Government. The dispensation to the gentiles failed; and the saints were scattered. The LAND OF ZION was first given to the saints of God from ADAM TO NOAH. Then it was preserved until a later time when it was given to the SEED OF JOSEPH—Native Americans included. In 600 BC, God commanded a prophet in Jerusalem to take his family and travel to a far distant land—Zion. The family soon divided into two groups: those who lived according to the law of God and those who lived by their own will. This is the same that happened after Adam–when the population began to grow and the people divided. The righteous group continued and were blessed while they lived by the law of God. In 400 AD–when they had departed from the law and thought to live by their own will–they were destroyed by the other group. This does not change the covenant which God made to them through Jacob. God declared the land of Zion as the inheritance of GENTILE SAINTS under Joseph Smith and James J. Strang. Shortly before and after the return of Jesus, God will gather all saints of God to their respective gathering places. Saints from Adam to Abraham will be gathered to the land of Canaan. Enoch and the former city of Enoch will become the New Jerusalem—the city of God. Saints of the seed of Abraham that obey the temporal covenant will be gathered to Canaan. Saints of the seed of Joseph will inherit the land of Zion. Gentile saints will inherit the land of Zion. Since Enoch and the saints of that time lived in the LAND OF ZION, this is where the GARDEN OF EDEN was located; and was the ORIGIN OF MAN. This is where the people of God lived until the time of Noah; when all the people turned against God except Noah; and were destroyed except for Noah and his family. Therefore, it took forty days and forty nights for the Ark to travel from America to Mt. Ararat. Mount Ararat is in eastern Turkey, adjacent to the Armenian border. It is the highest mountain in the area. Is it any wonder that Zion is spoken of so many times as a sacred land? This mystery could have gone unsolved were it not for the latter day prophets Joseph Smith and James J. Strang; who through revelation from God provided us wisdom concerning Zion and therefore the place of the Garden of Eden. It only takes a little more study and revelation to understand why the New Jerusalem will be in America. The Book of Genesis predated Moses. Moses provided a synapsis of some of Genesis. A more accurate and complete translation was made by the latter day prophet Joseph Smith. It clarifies many things. One of the most important parts of creation that is missing from KJT is that all things were created first spiritually. It is not possible to create physical things without first creating them spiritually. “For I, the Gord God, created all things which I have spoken, spiritually, before they were naturally upon the face of the earth.” (Gen. 2:5, JST). This most accurate and complete book of Genesis is available at: http://www.centerplace.org/hs/iv/.